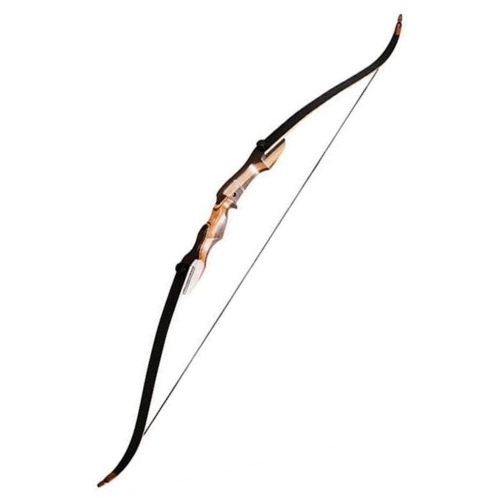 The Junxing Recurve Bow is a solid full-size bow with a great price point. Most of the entry-level bows commence with youth sizes, but the Junxing bow is an exception of those. It’s a perfect bow to try out by an adult or older teens especially those who are looking for a bow that is a piece of art and smooth to shoot. Junxing Archery established in 1993 and currently produced recurve bow, crossbow, compound bow and air guns which it sells in China and export over many countries including USA, Canada, Australia, Germany, South Africa and so on. It has gained a high reputation by manufacturing quality bows in its homeland and abroad. The Junxing bow comes with hard maple wood with fiberglass lamination and wooden riser which makes it sturdy and durable for beginner adult archer. The 66-inches Junxing bow design and developed such a way that gives a clear introduction to its client about the art of bows and arrows and the necessary aptitudes required to learn it. The structure of the device made strong and durable that can withstand the users’ amateurish handling, and the strength comes from Manchurian ash wood. Yes, the best quality Manchurian ash logs used to build the riser of Junxing recurve bow, and it also brings a tinted finishing on it which looks attractive. Though it’s an excellent bow for all level users, it supports only the right-handed shooter. However, you can check the Junxing Recurve Bow Left or Right handed for the left-handed option. It also included an arrow rest and a sight to ensure the highest performance during practice or competition. As like riser Junxing Archery put their maximum effort to plan and create their limbs lighter but sturdy enough to withstand against abuse. The limbs made of hard Maple lamination and cover by strong fiberglass as like your fishing rod materials which makes it flexible enough to bend but rare to break. Though the bow comes in a full-size 66-inches, it does not support your hunting game. You can be used it for short-range shooting competitions and family fun at your backyard. The Junxing archery crafted this recurve bow only in one draw weights that is 28 pounds. Nonetheless, Junxing bow is just right to create a string tension which makes it sturdy enough for small hunting game and fishing. Even the expert hunters could take a deer with this bow by using a nice sharp broadhead arrow from a closer distance. However, proper placement of shot will play a vital role here as a 28lb draw weight wouldn’t bust through a shoulder bone easily. Let’s hit the target with good accuracy and power with thanks of forgiving nature of the bow. Not only that, it designed with a comfortable non-slipping grip and lined with a thin cushion which helps to shoot less deviation. As the bow is long but not a heavy one, it will help you to avoid hand and arm soreness during longtime practice. Because of lightweight, it is easy to carry and store also. Q1: If I want to use higher draw weight in this bow, will it support that? Ans. : This bow is designed only for 28 pounds, so it might not support higher draw weights that this. Q2: There is no screw for arrow rest in the box. How can I assemble it? Ans. : The supplied arrow rest with Junxing bow is the adhesive form. So, you don’t need any screw for it. Take the back off of the rest and lineup it with the hole, that’s it. Q3: Is it suitable for hunting? Ans. : It entirely depends on the distance, size of animals and what type of arrows you will use. Usually, for hunting, you need higher draw weights, but if you are an expert hunter and shoot from a close distance, you can hunt even a deer with it. Q4: Is it comes with string? Ans. : Yes. It comes with a string. Q5: Is it comes with finger protector? Ans. : Yes. It supplies finger protector and arm guard in the box. If you want a wider variety of draw weights with the same price then SinoArt 66’’ will be a great option for you. It comes with metal riser with three different color and all necessary accessories including stringer, nocks, and screw on arrow rest. SinoArt also cares ambidextrous and right-handed archer too. Overall this is an excellent bow for beginners who want to go far in the way of archery. Another excellent beginner bow is SAS Spirit 66’’ for those who are 6 feet or up. The features and price are almost the same as Junxing, but SAS has a high reputation and long experience in bow making. SAS using best quality wood to build its riser and maple lamination with fiberglass for limbs. This complete takedown bow comes with four different interchangeable draw weights. According to customer feedback and values SAS Spirit 66’’ is little ahead than the Junxing takedown recurve bow. The manufacturer declared that the Junxing recurve bow is perfect for family fun of backyard shooting and a trip to woods for hunting. However, it is also suitable for amateurs’ archer who wants to develop their muscle to carry other substantial bows in the future. The best part is that those who are looking for a good bow with excellent price point it is a good option for them.